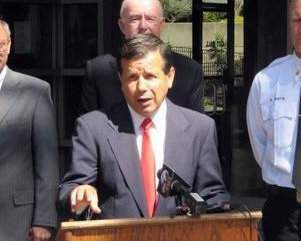 The Orange County Register has endorsed Mayor Miguel Pulido! Mayor Miguel Pulido remembers the tough times. In an interview with the Register Editorial Board he recalled a story from his first electoral run, when a constituent invited him into his house so he could show the then-council candidate the bricks the homeowner lined his walls with to protect his family from stray bullets. Now the 20-year incumbent of the mayor’s office boasts an almost continually declining crime rate and substantial rises in property values. That is likely why the longtime mayor has the backing of members of the business community, and receives our endorsement for another term. The revitalization of downtown is something certainly worthy of celebration. In fact, Forbes recently rated Santa Ana No. 20 in its “Coolest Cities” in America. But the city, and Mr. Pulido, also has to continue to strive for better. While the city’s downtown may make Santa Ana one of America’s “coolest cities,” work remains to be done in the most impoverished and gang-infested neighborhoods. That means mending the relationships of some residents who believe they must live in fear of their police. When residents view their anointed guardians as enforcers rather than servants, there is worrying breakdown in trust that will only compound the inability of law enforcement to tackle crime in troubled areas. Police Chief Carlos Rojas, to his credit, has done much to attempt to improve those relations, but work must continue to be done. The mayor must also work tirelessly to continue to make it a better place for the city’s residents, not just commuters. That includes showing a greater openness to improving and growing the city’s housing stock. Further, as the city’s unemployment remains far higher than the county average, that includes making the city friendlier to job-creating development and enticing business through a reduction in the rules, regulations, permits and fees that have made the city one of the more difficult places in the county to do business. As Santa Ana continues its marked rise, the city now more than ever will need strong leadership to keep it on the right path. Mayor Pulido certainly has much left to do. Note: The Orange County Register is headquartered in Santa Ana, and the company conducts a great deal of business in the city.